Huckleberry Finn meets Candide, but with added window cleaning – Glass is a charming, off-beat comedy about a young man finding his way in the modern world. Meet Gunter Glass: ex-milkman and aspiring window-cleaner, struggling to find his way in the modern world. Ever since a childhood visit to a glass-blower’s workshop, Gunter has had an unusual fixation with glass. When a minor adventure up the spire of Salisbury cathedral turns hiim into a local celebrity – and gives him a taste for extreme heights – Gunter is called to his dream job: cleaning Europe’s tallest skyscraper, London’s shard. Enchantingly unprepared for the bright lights of the city – and philosophically under-equipped for sharing a flat with an eccentric German intellectual called the Steppehnwolf – Gunter must navigate his own way through life, armed only with his monther’s homespun wisdom and knowledge gleaned from haphazard wanderings through Wikipedia. But will his innocence put him on a collisioncourse with the baffling modern world? Glass is a novel about learning to wise up to the world around you. 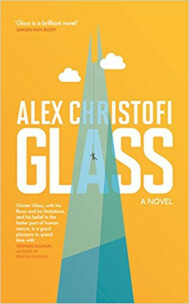 Charming, funny and slyly clever, it establishes Alex Christofi as one of Britain’s most exciting new writers. Winner of the Betty Trask Award (2016). Long-listed for the Desmond Elliott Prize (best debut novel, 2015). Featured among10 new fiction books deemed best of the season by the Independent (Spring 2015). First published by Serpent’s Tail (UK) in 2015. “Gunter Glass, with his flaws and limitations, and his believe in the better part of human nature, is a great pleasure to spend time with”. “Glass is a brilliant novel’. “Christofi’s writing really does gleam with wit, inventiveness and an offbeat charm”. Joanne Harris, author and judge of the Betty Trask Award (see above).